Cells and viruses use conservative site-specific recombination for a wide variety of biological functions. Some of these functions are discussed in the following sections. Many phage insert their DNA into the host chromosome during infection using this recombination mechanism. In other cases, site-specific recombination is used to alter gene expression. For example, inversion of a DNA segment can allow two alternative genes to be expressed. Site-specific recombination is also widely used to help maintain the structural integrity of circular DNA molecules during cycles of DNA replication, homologous recombination, and cell division. A comparison of site-specific recombination systems reveais some general themes. All reactions depend critically on the assembly of the recombinase protein on the DNA, and the bringing together of the two recombination sites. For some recombination reactions this assembly is very simple, requiring only the recombinase and its DNA recognition sequences as just described for Cre. In contrast, other reactions require accessory proteins. 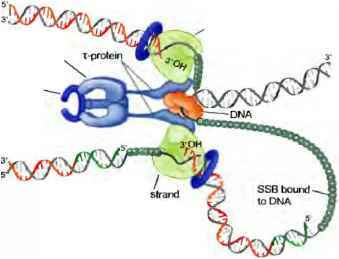 These accessory proteins include so-called architectural proteins thai bind specific DNA sequences and bend the DNA. They organize DNA into a specific shape and thereby stimulate the recombination. Architectural proteins can also control the direction of a recombination reaction, for example, to ensure that integration of a DNA segment occurs while preventing the reverse reaction—DNA excision, Clearly, this type of regulation is essential for a logical biological outcome. Finally, we will also see thai recombinase» can be regulated by other proteins to control when a particular DNA rearrangement takes place and coordinate it with other cellular events. When bacteriophage X infects a host bacterium, a series of regulatory events result either in establishment of the quiescent lysogenic state or in phage multiplication, a process called lytic growth (see Chapters 16 and 21). Establishment of a lysogen requires the integration of the phage DNA into the host chromosome. Likewise, when the phage loaves the lysogenin state to roplicate and make new phage particles. 31 must excise its UNA from the host chromosome, The analysis of this integration/excision reaction provided the first molecular insights into site-specific recombination.